Last episode we set the stage, on both sides of the line, for the actions of 1918. The Italians had just experienced a disaster at Caporetto, but they were recovering, the Austrians had just won a tremendous victory at the same battle, but they were having issues repairing their broken army. This week we will cover the actions of both armies during 1918. The first half of our episode will cover the Austrian attacks which began in the middle of June. Then the second half will cover the Italian attacks at the Battle of Vittorio Veneto, one of the cooler sounding battle names of the war, in my opinion. These events over the summer and autumn of 1918 will set us up for our discuss in episode 3 of this series where we will discuss the end of the war and its aftermath for the Italians and Austro-Hungarian Empire. Interestingly enough the root of the Austrian attacks in 1918 did not even occur in the year 1918, and not even in the last half of 1917, but instead in March. After the Germans launched their Spring Offensive in March 1918 the French let it be known that the Austro-Hungarian Emperor Karl had, in March 1917 floated peace offers to the French. This in and of itself was not a problem, the Germans had also floated peace offers during 1917, the problem was that that the Austrians did not completely deny the French desires to recapture Alsace and Lorraine. This made the Germans rather angry, as far as they were concerned Alsace-Lorraine was not even on the negotiating table no matter what happened. This resulted in a very tense meeting the next time Karl met with Wilhelm at Spa about a month after the news got out. At this meeting the German leader pretty much forced Karl to agree to attack Italy. During this conversation with the Kaiser, Karl would promise a two pronged attack from the Asiago and across the River Piave. Both of these attacks would seek to drive the Italians from the areas around Venice and then from the city itself, which if accomplished would have been a huge blow to the Italians. While Boroevic was very pessimistic about their chances, the Austrian army at least looked strong on paper. There were over 50 divisions on the Italian front, and there would be 10 in reserve behind. This represented a strength of 2.8 million men, or at least it did if the divisions had been at full strength. The problem was, of course, that they were not at full strenght. Instead many divisions were at 3/4, or even 1/2 strength, and some were as low as a 1/3. Even new battalions being sent to the front were being formed with their units at half strength, right from the start and before the even got to the trenches. This meant that instead of 2.8 million men the Austrian army only had around 950,000 combat effective troops for the attack. For the attack 23 divisions would be placed on the Asiago, and 15 would be on the Piave. The latter would be the more important of the two attacks, with its objective being none other than the city of Vencie itself. The Austrians would attempt to use a system very similar to what they had done with German help at Caporetto, utilizing infiltration tactics and assault troops to break through the Italian lines. After detailed planning and preparations were completed, the date for the attack was settinged on June 15th. While the 15th was supposed to be the date that the entire offensive began the attack on the Asiago would actually happen two days early. This change was made after it was discovered, due to a deserter, that the Italians knew exactly what was planned for the attack, and exactly when it would happen. Conrad hoped that by starting the attack early it would throw the Italians into disarray. This meant that the assault troops would start forward at 730AM on the 13th of June, and they made some good initial progress. Most of this success came in the areas where the front was covered by fog, just as it had been at Caporetto. While the fog hindered the efforts of Austrian artillery, it helped to hide the Austrian attackers, making them far less vulnerable to Italian artillery and machinee guns. But they did not make it all the way through the Italian defenses, and were instead slowed and then stopped in a method very similar to what usually happened on the Western Front. Conrad then committed most of his reserves to try and restart the advance, but this was unsuccessful and it just meant more casualties. 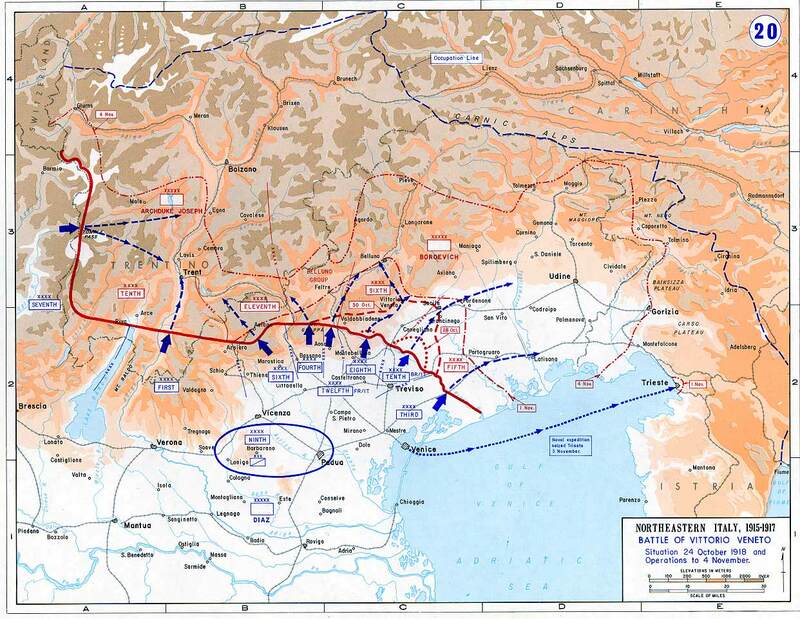 The attack on the Piave remained on schedule, and at 3AM on the 15th the artillery fire began. The initial plan was for a precise bombardment to fall on the Italian artillery, which by this point was also joined by many British and French guns. However, this goal was difficult to accomplish due to the complete control of the skies that was exercised by the Allies. This control prevented any possibility of aerial spotting. The Austrian gas shells, upon which they placed great hope of disabling some artillery batteries, also proved mostly ineffective due to the recent arrival of British gas masks, which proved far superior to the Italian ones that had previously been used. At 5:10AM the Austrian guns moved their fire from the front line to more distant targets, but the Italian guns were able to begin shelling the Austrian jumping off positions, causing difficulties for the Austrians before the attack even started. The only good news about any of these preparations is that they mostly caught the Italians off guard, and this surprise was always a positive for an attack. On the Pieave the attack began well, during the morning over 100,000 men were able to cross the river. However, getting beyond the river would prove to be far more problematic. The Italians had gotten much better at a more elastic defensive method, and because of this they were able to absorb the Austrian advances without breaking like had happened at the Caporetto where instead of absorbing the attack the Italian lines had completely collapsed. This more effective defense meant that the Austrians were able to advance about a mile in some areas, but there was always resistance, and the deep set of defenses were slowed down the attacks. While the Austrians were advancing their strength was slowly ground down by Italian artillery and machine guns. Then just as the Austrians were reaching the end of their abilities the Italians hit them with a heavy counter attack and many units were thrown back almost to where they had begun the day. On the second day the situation was even worse for the Austrians. There were discussions about halting the attack on the Asiago and moving troops south, but even this question became somewhat academic as it became clear that the troops who had made it across the Piave might not be able to hold onto their gains long enough for reinforcements to reach them. Overall, the Austrians were running out of artillery shells and their exposed positions, newly occupied the day before, became the target of a seemingly endless deluge of Allied artillery fire and aerial bombardment. As the Austrians tried to hold onto their gains, and sometimes enlarge them, they were being slowly chewed up by the Italian defenders. On the third day, when the Austrians once against tried to attack they were met not by disorganized, partially exhausted Italian troops, but instead fresh ones newly arriving at the front. Fighting would continue along the front for several more days, but it was clear to everything involved that the period of greatest Italian weakness had already passed. The effects of the failure were felt far more than just as casualties. The Austrian army, which had stuck together for so long, far longer than many would have thought, began to fray at the edges. From July to October the army went from 650,000 to 400,000 men, many of these being deserters. There were no widespread mutinies, men just sort of drifted away from the fighting, preferring to go back home. Those that did not desert were often beset by all kinds of diseases. By this point the Austrian rations were far below sustainable levels, and the average body weight of the soldiers had dropped down to just 120 pounds, or 50 kilograms. This set the troops up to be very vulnerable to diseases like dysentary and eventually the Spanish flue. Sanitation was also almost non existent at the front. Laundry units were shut down because there was literally not soap for them to do the washing with. All of these issues reduced the already hugely understrength Austrian divisions to mere skeletons of their former selves. With the situation continuing to decline, in August the Austrian high command informed the Germans that they would not be able to stay in the war past the end of 1918. At that point the troops at the front would simply have to be brought back home to deal with unrest on the home front. At the front the troops would spend the rest of the summer either trying to stay alive or preparing for the expected Italian attack. 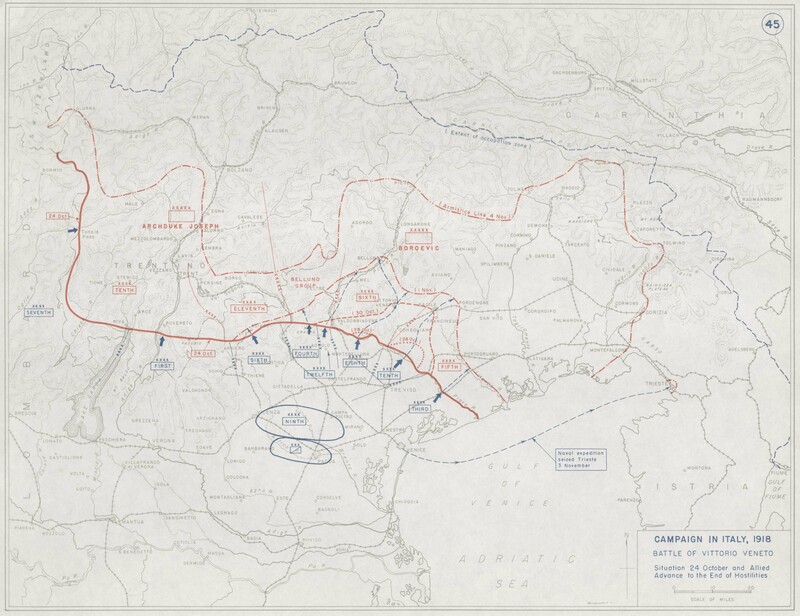 Losing the line at the Piave to an Italian attack was a foregone conclusion, and instead the Austrians aimed to simply fight a delaying action back to the primary line of resistance at the Tagliamento. This was a smart move, but even this cautious approach would prove to be untenable, especially after Bulgaria left the war in September. The removal of Bulgaria from the board freed up the Allied troops in Salonika to march north, and there were simply no Austrian troops that could be sent to meet them. The war in the Balkans and in Italy was reaching its climax, all that was left was for he Italians to launch another attack, and it had a high likelihood of being a war-winning effort. After the Battle of the Solstice the obvious move for the Italians was to counter-attack the Austrians at the first available opportunity. But even in these very favorable circumstances, Diaz still resisted calls for an attack. For three months Diaz remained cautious, and in this decision the government supported him. However, by October it was clear that the Germans and Austrians were teetering on the brink and there became important political reasons for the Italians to attack soon. In Rome many politicians were concerned that if the Italian army did not attack, and hopefully occupy most of the territoroy thathe Austrians had taken, they would be denied some of the things that they had been promised when they entered the war. Remember Italy had only entered the war when promised a piece of the Austro-Hungarian empire. With pressure from Rome mounting Diaz planned his attack for the second half of October, with the date finally landing on the 24th. The goal of this attack was to push through the Austrain lines between the Austrian fifth and sixth armies, if this could be achieved the Austrian positions on the Asiago and to the south new Monte Grappa would be forced back due to the simple danger of being cut off. If everything went well an attack would push the Austrians into a headlong retreat. The Italians would have 57 infantry and 4 cavalry divisions to execute their attack, and this included 3 British, 2 French, and 1 division of Czech volunteers. This game them the advantage in manpower, and they also held huge advantages in artillery and in the air. The superiority in these two areas had just continued to increase since the Austrians had launched their attack and by October the advantage was suffocating. Boroevic hoped to be able to trade some ground for time, and while this couldd have worked, it relied very heavily on the army sticking together. Retreats, even planned ones, can always turn onto routes, especially with an army in the state that the Austrian one was in. Unfortunately for Boroevic, in the middle of October Emperor Karl made some decisions that really sabotaged his efforts at defending against the Italian onslaught. On October 15th the Emperor had made a declaration that put the Empire on the path to dissolution, by announcing much greater autonomy for the various nationalities inside of it, an announcement prompted by pressure from teh Hungarians. This caused a lot of confusion in the Austrian units, and while many troops at the front would say in place, in the rear areas it was complete chaos as entire units began to simply march home. The front line was somewhat unaffected at the start, but after a week, on the 24th, the very same day that the Italian attack was scheduled to begin two entire Hungarian divisions, believing that they no longer were required to serve in the Empire's armies, left the trenches and started for home. In this environment of disorganiztion, any coherent defense was simply impossible. While a coherent defense would prove impossible, that did not meant that an incohorent defense would not be costly for both sides. On Monte Grappa the fighting becamea bloodbath and after 6 days of fighting the Italians had lost 25,000 men, with very little to show for it. This failure was mostly due to a complete lack of coordination between the infantry and artillery a problem that had plagued the Italian army for the entire war. But while the situation on Grappa was favorable for the Austrians, in other areas it was the exact opposite. On the Piave the start of the offensive was slightly delayed, but when it did start it began well. At the start of the attack pontoon bridges were thrown across the river and throughout the day a constant stream of troops moved across. The number of troops crossing the bridges had to be conrolled so that they did not collapse the fragile structures, but they proved more than capable of getting enough men across the keep the advance going. It was actually a British division that would spreadhead one of these advances and a British divisional history would say that at this point 'Not many Austrians stayed to fight, the majority, surprised and dismayed at the failure of the wire to hold up the attack, streamed back inland in disorder, almost too fast to give the riflemen and Lewis gunners much chance to shoot them down.' In some areas, even when the Austro-Hungarian units chose to stand and fight they were often betrayed by the units on their flanks, who would surrender or just retreat, leaving any defenders still in the line to be surrounded and captured or killed. The day after the attack began Boroevic would report to Vienna that the resolve of his troops, especially those that were not German, was weakening greatly and that there were already several reports of mutinies. Boroevic began to order a series of retreats in an effort to save as many troops that still listened to him as possible. This saved some units, but others were already pulling back as fast as their feet could carry them. Boroevic told the government that they should try and begin negotiations with the Italians, he hoped to offer them a retreat to pre-war boundaries in exchange for a peaceful withdrawl. While they retreated many Austrian units destroyed their supplies, with large ammunition dumps being lit on fire to light the night sky. Other units never received the order to retreat and were forced into either surrender or heroic defenses that few would live to remember. While the Austrians were scrambling the Italian advances continued. By the 30th there was a non-stop flow of Italians over the river, and they were taking 10s of thousands of prisoners at almost no cost to themselves. On October 28th Bohemia and Galicia declared their independence, on the 29th Slovenia, Croatia, and Bosnia followed suit. On the 30th Boroevic asked his headquarters what he should do if he could not defend the borders of the empire. The response told him simply to keep as many units togethre as possible and to try and bring them back home, once they reached Vienna they would be separated and sent to their new nations. By November 2nd the Italians had recaptured all of the Asiago Plateau and they were advancing on the Tagliamento. The Austrians were now actively looking to end the war, but the Italians did not want to stop now. After 3 years of failure they finally had their victory. But the Austrian army was disintegrating and the Empire was falling apart, it was only a matter of time before the end finally came, an end to the war, an end to an empire.